MLG201Magnetic level gauge is a most reliable instrument where direct level measuring is required. It can be used with level transmitter. The principle lies in the reflection of the outer light. In the steam or gas phase the light is reflected by the prismatic grooves of the glass therefore gives a clear appearance. In the liquid phase the light is absorbed thus providing a dark indication of the level. 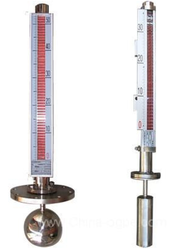 Tubular level gauge is a most economic instrument where direct level measuring is required at low pressure.It conists of a C channel frame or tie rods with process connection, glass tube & valves. 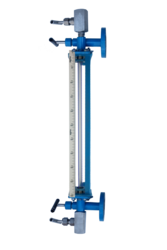 Glass tube is fixed between two valves which directly indicates level of the process fluid. The level of liquid inside the glass tube is same as the liquid level in the tank. Scale mounted on C-Frame indicates liquid level. Float & board level gauge is a simple economic level measuring instrument. It consists of scale board, pointer, pulley, pulley housing, connection pipe, wire rope, float, guiding flanges, process flanges, anchor plate. Top mounting brackets & side mounting brackets are provided to mount the scale board on the outside of the tank. Connection pipe, pulley, guiding flanges are mounted on the top of the tank. Anchor plate is fitted on the bottom of the tank.Float is set to float on the liquid level surface. Float is tied with wire rope passing through the pulleys connected to pointer which rolls on scale board. The level of liquid inside the tank is directly shown by the pointer rolling on the scale board. It consists of a chamber and an internal float in non-magnetic material compatible with the liquid. The float containing a magnetic system rides on the liquid level and is coupled to an external visual indicator, which comes in two options. The simpler & economical design consists of a RED magnetic follower capsule, that moves within a glass tube filled with water (to reduce friction) and can be read against a scale. WHITE on front side and contrasting RED on the reverse.. These flappers rotate corresponding to float movement, thus changing their colour from WHITE to RED as the float rises and vice-versa when the float falls. As such the liquid level represented by an external RED column. Ideal for level indication in high pressure, high temperature application.